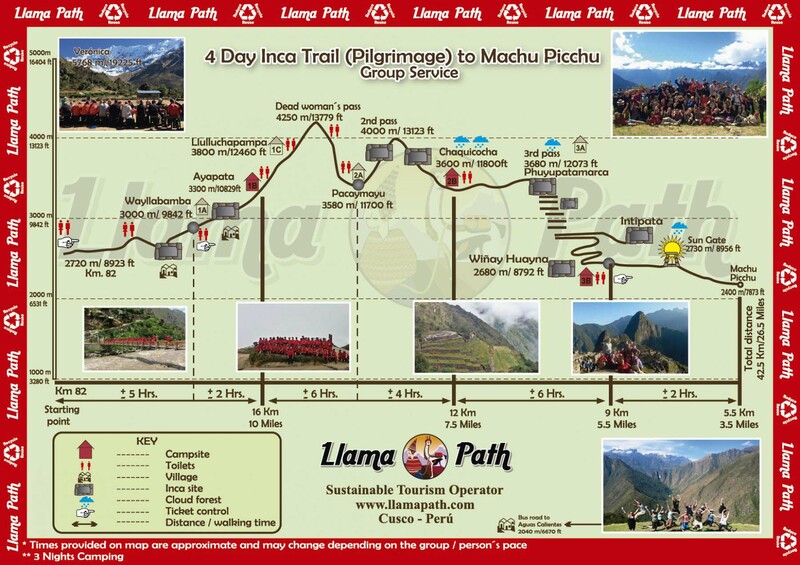 Go Back in the past, Go on the Inca Trail, Go with Llama Path! Do not think too much, spaces are selling out! The Classic 4 day Inca Trail is Peru's number one trek and one of the most well-known and popular treks in the world. Offering 4 days of trekking along original paved Inca pathways, a variety of fascinating Inca sites and the beautiful scenery of the Machu Picchu national park the Inca Trail is one of those things that everyone should do once in their life. Be you young or old, in good shape or bad, the Inca Trail is for everyone and is a must do if you plan to visit Machu Picchu. Walk through typical andean valleys, grasslands, cloud forests, visit ancient Inca ruins along the way to arrive in Machu Picchu by sunrise! We have very prossional and knowledgeable Guides and there will never be a moment you'll feel you don't know what to expect each step of the way. The porters not only carry equipment but there will even have the time to be cheering you along the whole way. In Llama path we really treat the porters with respect. The food is amazing and you cannot think of a meal you do not like. Our chefs will make sure you do not go hungry and will constantly feed you AMAZING food. If you are looking for a company to go for this trip Llama Path is the one to go with. We will help you along the entire process! Prices 2018 (from 1st March 2018 to 31 January 2019). US$ 655.00 Students with a valid ISIC card. We offer daily departures on the Inca Trail (excluding February when the trail is closed) - Check Availability with us by e-mail. It is strongly recommended to book your Inca Trail at least 4 to 6 months in advance as permits can quickly sell out especially for months April to August. We leave with a minimum of 2 people. Our average group size range from 8 to 16 people. Highest Altitude - 4217m / 13,780ft (Day 2). Overall Difficulty - Moderately Difficult to Difficult (depending on your level of fitness). Youngest person we have ever taken: 2 years old. Oldest person we have ever taken: 78 years old. We began our trek (4 days, 3 nights) at the end of August, but we reserved our spots online with Llama Path in February/March. I would recommend 1) upgrade to the $50 train ride from Aguas Calientes to Cusco when you are finished at Machu Picchu, and 2) booking a ticket for Huayna Picchu climbing. Llama Path recommends that you arrive in Cusco (or another high-elevation city) ~3 days before your departure to acclimate to the altitude. Many people in our hostel and on our trip became altitude sick (headaches, digestive issues, vomiting, basically feeling hungover), but we didn’t. We did have some digestive issues (all controllable, but I will spare you the details) so for that, I would recommend bringing your medicine of choice: Midol, Pepto Bismol, Tums, etc. I didn’t see many people taking the altitude medicine, possibly because it makes you super dehydrated. As soon as you arrive in Cusco, you should go to the Llama Path office to check in and pay any remaining (LOcal Payment) dues if you have them. Then, you’ll have a group meet-up the night before you leave to meet your guide and fellow trekkers. They have a presentation and they’ll go through who’s renting what, etc. YOU SHOULD TOTALLY RENT TREKKING POLES. We shared 3 between the 2 of us and it was really helpful. This is also the time to rent a last-minute porter if you are feeling overwhelmed. (If you do end up backpacking, you should bring a little string-bag and leave your spare clothes at your hotel/hostel. it lightened our load quite a bit, and it’s free). This meeting is also when you should remind them if you abide by a different diet than most! You will meet your group around 4 am at the Regocijo Square on your departure day and take a bus to the starting point (stopping for breakfast beforehand). If you’re veg, you will be eating a lot of fruit, dry cereal, and bread at this restaurant. They had eggs too. This is check point number one to make sure to bring cash. Breakfast was 40 soles per person. The first day was tough because it was hot. Make sure you have water filled, sunscreen on, a bandana/hat, and sunglasses. Most people hiked in pants and a short sleeve t-shirt (end of winter there). There are indigenous folks who sell snacks and water/gatorade at various pit stops on days 1 and 2. There are also toilets along the way and you’ll want to bring soles (coin money especially) for these (worth it!) they also sell toilet paper if you need more. Lunch and dinner were always 3-4 course meals, it was unbelievable that the porters carried that much food. Often times, there was too much food and we would be completely stuffed. If you’re veg: the chef will make you your own meals. We had amazing rice, veggies, soups, pasta, I don’t even know what else but it was really really tasty and filling and spiced to perfection. The chef even made a chocolate cake on the last night (how????????????!!!). There’s also a dining tent with tables and chairs that they set up for every meal. It’s quite luxurious, almost too luxurious when you think about all the unnecessary weight these porters are carrying. But this is not just a Llama Path thing, and they definitely treat their porters the best out of all the companies operating on the Inca Trail. Llama Path trek provides you with a foam sleeping pad but we also had our own sleeping pads the two together was extremely comfy. We also shared a 4-person tent between the two of us and the extra space was delightful. Every night when you arrive to camp (and every morning when they wake you up) they have fresh juice/tea, and individual hot water basins for everyone to wash up in. There were also bathrooms (glorified pit toilets) with running water and sinks at every camp site. The porters will boil water for you every day and night as well. We cannot express enough gratitude for our guides our lead guide, is probably one of the smartest people I’ve ever met. He expertly infused our trip with history, Incan and Peruvian culture, geology, sustainability, and eco-tourism. Our Guide made a difference in each of our group members' lives, and I can only hope that you are lucky enough to have him as your guide and experience his amazing speeches at the Inca sites and dinner each night! Our assistant guide, was truly amazing and helpful. On the first day, there were two people who had to turn back due to altitude sickness, and he accompanied them. We didn’t see him for most of the trip, but on Day 3 we were approaching the last Incan Site before Machu Picchu and ran into him (he had entered the trail backwards and came to meet us) and I cannot express how happy we were to see him! You will see so many amazing sites along the way while you’re hiking, and they get progressively cooler as you go further along. I won’t give away any spoilers. When you arrive at Machu Picchu, you will need to pay 5 soles to stow your bag (unless you have a tiny backpack, that will probably be fine to keep on you). You’ll go through Machu Picchu with your guide and after an hour or two, the group will part ways and most (if not all) will go to hike Huayna Picchu, which is an hour-long, very, very steep but really fun hike/climb (if you’re into that sorta thing) that gives you the “overlook” view of Machu Picchu that you see in all the photos. Highly recommend, and you should book that months in advance with Llama Path. When you’re done, you’ll take the free bus shuttle down to Aguas Calientes and grab food, souvenirs, have a drink, etc before you board your train back to Cusco. Everyone on our trek was very inclusive and we had zero problems while we were on the trail. I’ll add that throughout the rest of our Peruvian adventures, we laid-low, but still shared a single-bed hotel room in multiple cities and never had an issue. -Lot’s of cash — you should probably bring about 500-600 soles per person on the trek just in case because your tips will depend on how big your group is and there’s no ATM until after you leave Machu Picchu (the porters leave before you get to MP, so there is no other opportunity to tip them, and they deserve it). Keep in mind that you "should" tip the chef, the porters, your guide, and your assistant guide. Our campsite for the night is at Ayapata (3300m / 10829ft) which is a little further along the trail than most groups go; as we're camping further up the trail the next day's trek up to the pass is a little easier for us and with fewer tourists at the campsite we can enjoy the peace and tranquility of this beautiful place. On arrival to Machu Picchu you'll have a 2 hour guided tour of the site during which you'll learn about the Incas and visit all the most important areas of the citadel. After your tour you'll have free time to explore the site by yourslef and if you have permits to climb either Huayna Picchu or Machu Picchu mountain. In the afternoon you will take the train back to Ollantaytambo from where you will carry on by bus back to Cusco. Video Brieffing of the 4 Day Inca Trail, Group Service. Personal Porter (Need to be hired well in advance). Inflatable mattress (can be hired from us). Walking poles (can be hired from us). Breakfast on Day 1 and lunch and dinner on Day 4. Entrance to Huayna Picchu Mountain (this 2 hour round trip needs to be booked in advance). Entrance to Machu Picchu Picchu Mountain (this 3 hous round trip needs to be booked in advance). Tips (the amount you tip (or if you tip) is a personal decision and it is NOT an obligation. PLEASE NOTE: Times provided may vary depending on your acclimatization and level of fitness.. Walking sticks (can be hired from us). Optional: Sandals, bathing suit etc. Prices 2017 (from 1st March 2017 to 31 January 2018). US$ 635.00 Students with a valid Studend card. US$ 655.00 Under 18's Discount: US$40. US$ 659.00 Student and Under 18's Discount: US$40. Vistadome/Panoramico 360° Train upgrade: FROM USD50.00 (Please check). You can either book by emailing us or by using the Booking form on this site. Choose the option ´send money´ to: deposits@llamapath.com (IMPORTANT: please ensure you choose the option ‘purchase’ and ‘services’. Do not choose the option ‘personal’). 2) By VISA card: NO Transaction Fees from January 2nd, 2017 !! The Local Payment (Payment of final Balance) can be paid in cash and in US dollars or Peruvian soles (if paying in Soles it will be applied the exchange rate of the day).